P&M: Ready for the Move. 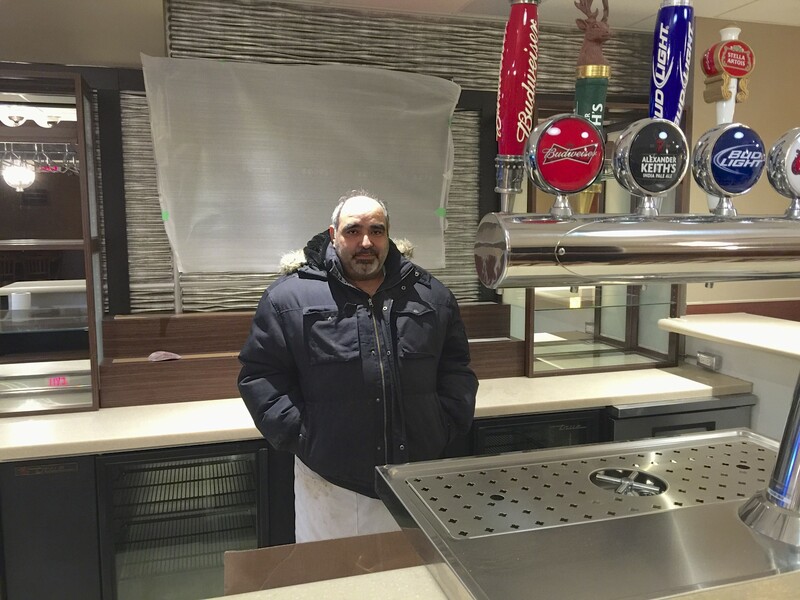 Frank Kalamaris and his family run a well known and very successful restaurant right in the heart of Weston. P&M has been serving Westonians since Frank’s father George opened for business on April 15, 1975. Every day is busy but empty seats are especially hard to find during the lunch rush with only 24 chairs crammed into the tiny dining room. Up to four people jockey for position behind the 18 foot kitchen / serving area. Instructions are passed back and forth in English with the occasional few words of Greek mixed in. 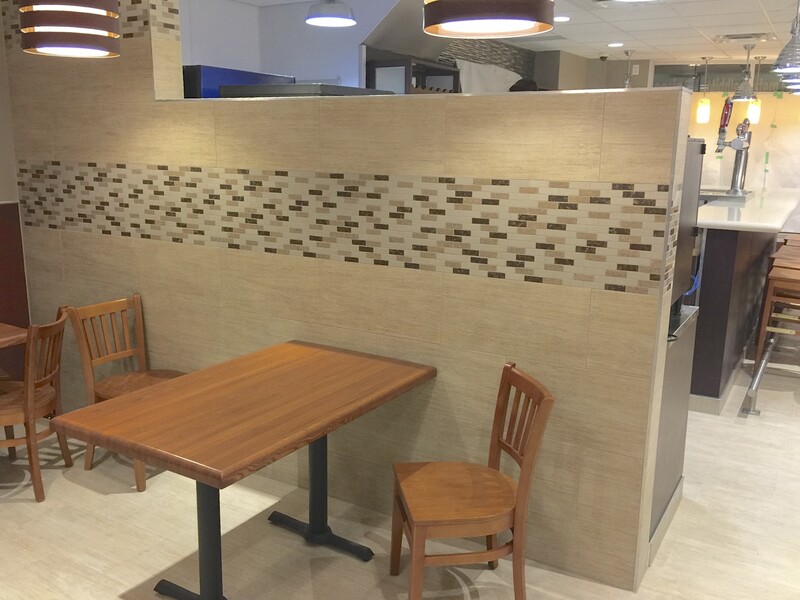 From this tiny work area, customers are served generous portions of delicious food. Wider at the front, narrowing to barely 7 feet wide at the back where the dishes are washed, the atmosphere is one of respectful friendship and regular customers are known by name. Nowadays Weston is a lot different but Frank is so sure that things are turning around, he has invested $1.2M in a new location just a few yards south at 1946 Weston Road. Until recently, this was the home of the Central Bar and Grill which had in its latter years fallen into disrepair and had a dubious clientele. Frank has done a total inside and out renovation of the building and it is now unrecognizable. The key to Frank’s success is quite simple, ‘You have to respect the customer’ he says in his trademarked gravelly voice. ‘They don’t want to be a number, like in the franchised restaurants, they want recognition and respect and to do that we treat them like friends and family’ To Frank, it’s not about the money. ‘Lots of business people come to Weston to take money out; they invest nothing and end up lowering the quality and driving away business. Success means doing what you have to do to get customers to return regularly’, and in that Frank has succeeded wildly. With plans to continue serving top quality food cooked to order; (things like fresh cut French fries, Black Angus triple A beef), he’s now planning to make the numbers of his extended family of customers bigger; a lot bigger. With the extra room and a gigantic open-concept kitchen he can seat more friends and serve a bigger variety of dishes. Frank plans to supplement the regular fare with more international dishes and weekly specials. 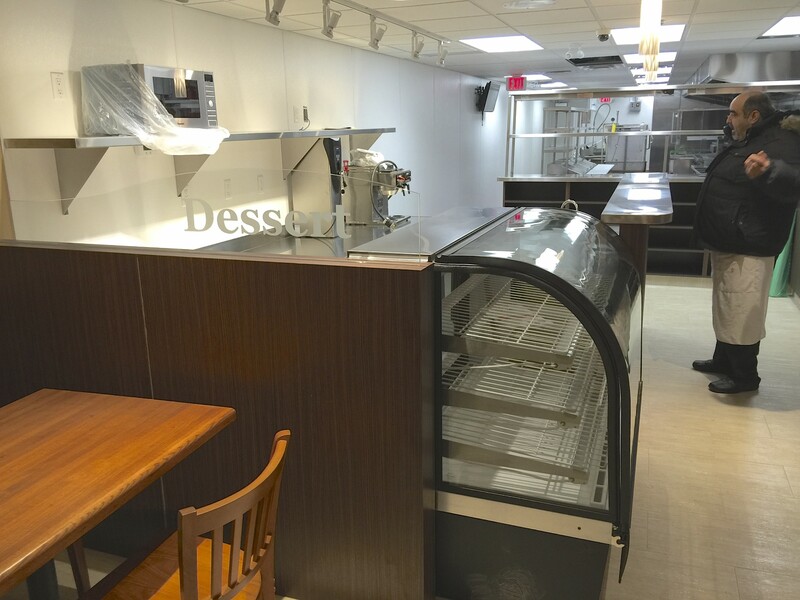 For those with a sweet tooth, there will be a dessert station with a full dessert menu. 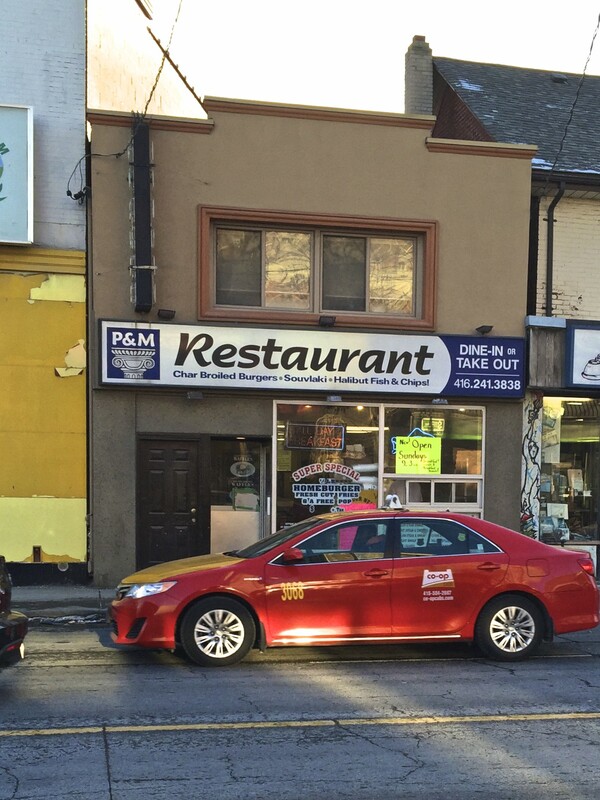 The new restaurant will be licensed (currently under application); a service bar will be there for staff. Frank gave WestonWeb an exclusive preview of the renovated premises and even in an unfinished state, the new P&M’s is very impressive. 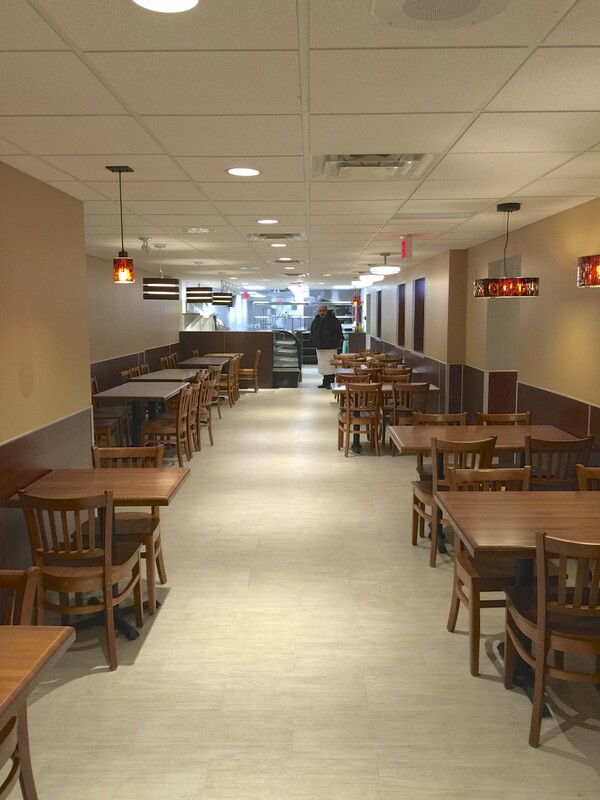 Attention to detail and top of the line decor, furnishings and equipment will set this restaurant apart in Weston. Frank stands behind his new bar. The left-half of the restaurant with the dessert station at the back. Butcher block tables and ceramic decor. 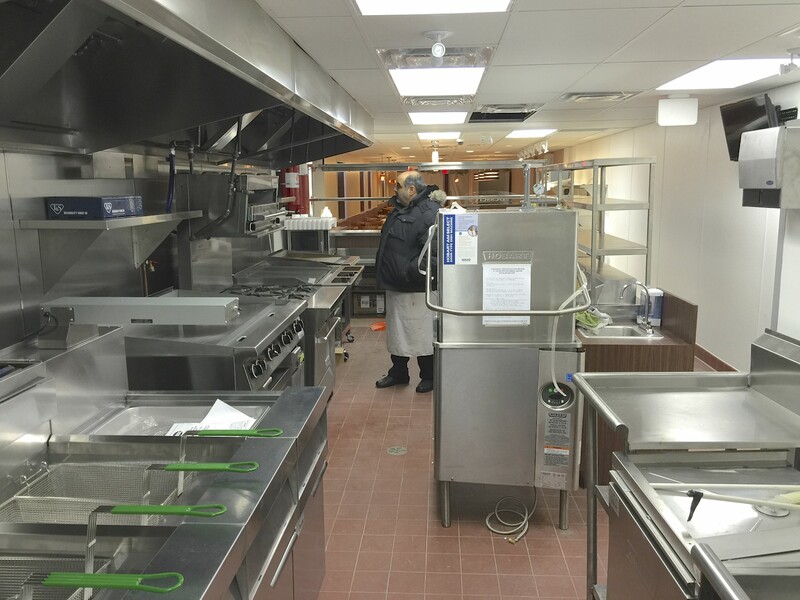 Top of the line equipment is being installed in the new kitchen. 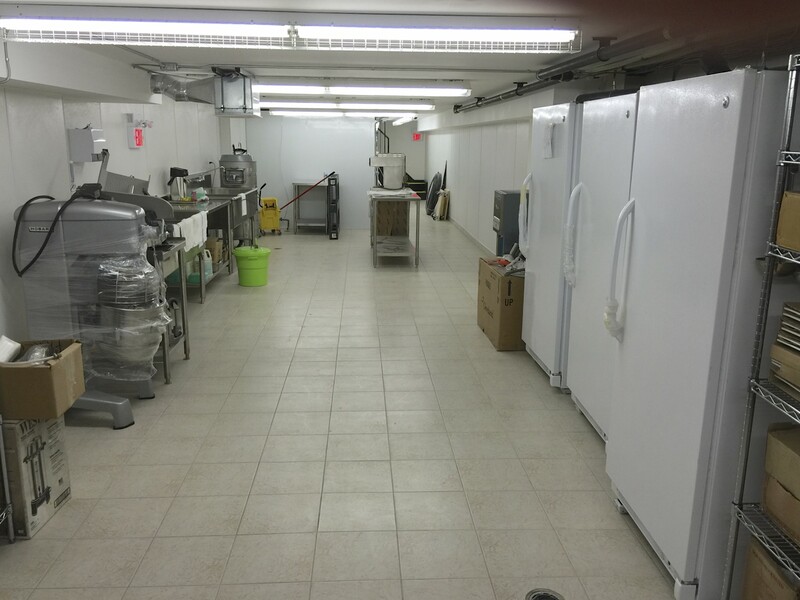 A huge food preparation and storage area is being set up in the basement. The new premises at 1946 Weston Road still under wraps. 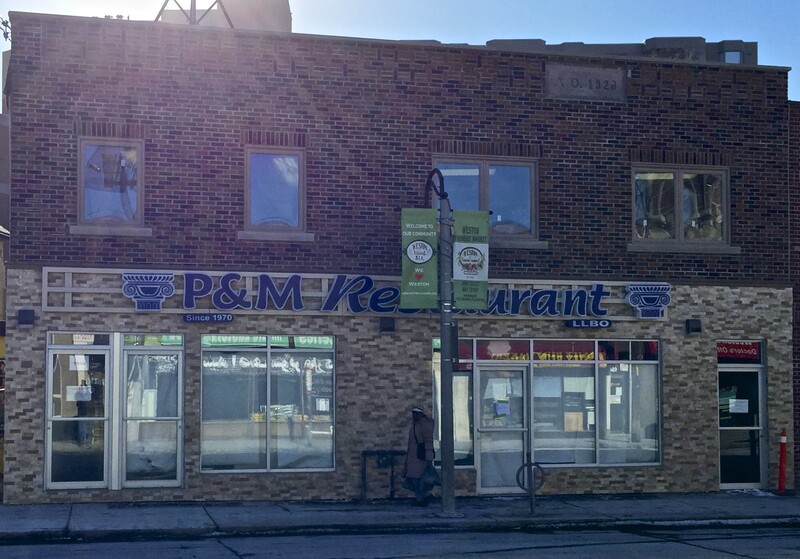 Frank doesn’t know exactly when the new P&M Restaurant will open as there are a few finishing touches to be made and inspections to be completed. The Fire Department will need to calculate his seating capacity, but no doubt when the date is announced, many will flock to the new location. ‘I may need to have several opening days’, joked Frank, ‘But I would like to have Councillor Nunziata there; she has been very helpful in dealing with the City’. Great to see the photos and the new restaurant looks wonderful! Thanks for the interview and the inside view from Frank: everyone is looking forward to more P&M! OMG they have beer!!!! finally! Cannot wait! This Whole Amazing Family deserves all these Blessings and success!! I moved to the area a few years ago, and while I might not be able to scrape up enough money to eat out too often, Frank always seems to remember me as Fish n Chip Girl. I love this restaurant, and recommend it to everyone who’s in the area! I can’t wait to see the new location. Best of luck!! Wow this Amazing Frank and Family! Great service and very clean restaurant ! Everyone was made to feel at home! I loved working there ! I wish you Frank and your family all the best! Can’t wait for spring then I will come and visit !! Is this Dolly that knows Heather Jones? Frank, Nicky & family….it will be worth the drive from Peterborough. Can’t wait 🙂 Looking forward to seeing you. I can’t wait for you to open. I haven’t been to your current location in a long time as we find it hard to get seating, but we are looking forward to going to your new location on a regular basis. The New P&M’s looks great:Congrats to you Frank and your family can’t wait for your new establishment to open. Next Next post: Best Place To Live in the World? Toronto – we have proof!